Today was a great trading day as Reliance Industries announced an issue of bonus shares in the ratio of one equity share of Rs 10 each fully paid-up for every one equity share of Rs 10 each of the company and thus it helped to boost the sentiment of the market but failed to help the stock as bonus issues do not change anything fundamentally for the valuations. The last time 1:1 bonus was on September 13, 1997 by the company. Moreover Board has declared a dividend of Rs 13 per fully paid-up equity share of Rs 10 each. Tomorrow will be also a great day as Infosys results will be out tomorrow and thus will kick start the results session which will determine the market direction in days to come. As an advice trade in Infosys after seeing its results for half year and if it crosses 2351 than bulls will take charge else bears take control and one need to closely monitor 2188 level which can be its strong support and same needs to be broken to put the bears in control of this stock. Infrastructure stock from the stable of the company which has issued bonus recently. A Reason to cheer for an unexpected Holiday 13 Oct 2009, market will be closed in view of General Assembly Elections in Maharashtra. Do remember to check our Swing Trading tips as the same is of a great use for the investors who can not watch the trading screen or can wait for a few days. As an experiment we have chronologically listed the stocks in priority for trading and thus the stock listed first has high reliability in trading as compared to stock listed below. 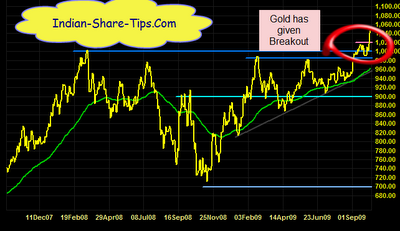 Gold has rallied to new highs on dollar concerns and same is amply depicted in below chart. Gold can in times to come can rally to $1300. Indiabulls Power price band likely to be Rs 42-45 per share. Godrej Industries gets nod to develop real estate. Godrej to set up SPV to develop Vikhroli property in Mumbai. The inflation figure for week ended September 26 has been announced at 0.7%, versus last week's figure of 0.83% for week ended September 19. Gokul Ref is considering stock split from Rs 10 to Rs 2 on 15 Oct.
Sonata Software is coming with interim dividend on 21 Oct.
Reliance MediaWorks ltd is the new name of Adlabs films ltd. The company operates BigCinemas . The Company is into film processing and in all other verticals. Apollo Group to invest Rs 1,800 cr; add 2,000 beds.